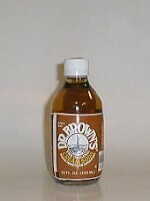 A&W Sparkling Vanilla Cream Soda CARBONATED WATER, HIGH FRUCTOSE CORN SYRUP AND/OR SUGAR, CARAMEL COLOR, SODIUM BENZOATE (PRESERVATIVE), NATURAL AND ARTIFICIAL FLVAORS, CARAMEL COLOR, CITRIC ACID, FLAVORED WITH VANILLA EXTRACT, CAFFEINE. Good stuff but it could be better. It lacks a little kick in the vanilla department. 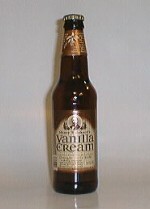 Other than that, you could chug a six pack and make youself blissfully ill. A rather average vanilla cream flavor. Nothing jumped out at me to make me want more nor did anything really turn me off. A.J. Stephans Pure Vanilla Creme Soda PURE CARBONATED WATER, CANE SUGAR, FLAVOR, COLORING, SODIUM BENZOATE (PRESERVATIVE) This is by far the BEST smelling soda I have had in a mug under my nose. Vanilla cotton-candy sums it up well. Except for that typical A.J. after taste, this is a good drink. I liked it and I think you will too. At least use it for potpourri if nothing else. I took the first drink and lit up a big ol flavored smile. Then the real taste kicked in and smacked that smile right off my face. In defense of AJ , I think they forgot to put the word “Diet” on this diet flavored drink. Why is Jeff frowning? I’m gonna go brush my teeth now. Dad’s Classic Cream Soda CARBONATED WATER, HIGH FRUCTOSE CORN SYRUP AND/OR SUGAR,CITRIC ACID, SODIUM BENZOATE (PRESERVATIVE),CARAMEL COLOR, NATURAL AND ARTIFICIAL FLAVORS. Light soda, probably sums it up. The flavor is not bad and it does not have a nasty aftertase. What it does not have is a heavy cream soda flavor. I guess you could classify this as ‘refreshing”, maybe? I will have to test it out on a 110 degree day and let you know. A little yeller. I had another word but I forgot what it was. oh yeah…noickyaftertaste. 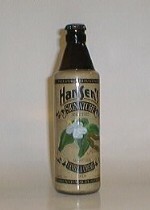 Hansen’s Signature All Natural Vanilla Creme Soda TRIPLE FILTERED CARBONATED WATER, CANE SUGAR, CITRIC ACID, BLEND OF MADAGASCAN, INDONESIAN AND TAHITIAN VANILLA EXTRACTS, HONEY, NATURAL FLAVORS Very good flavor, insta-belch with the carbonation. I think the carbonation ads to the ‘soda water’ after taste. Other than that, it is a very good drink. Initial flavor is satisfactory, as with many cream sodas we are left with icky mouth. Hansens is no exception. Don’t drink too many. 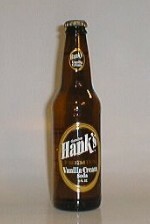 Henry Weinhard’s Vanilla Cream Premium Draught Style Soda CARBONATED WATER, HIGH FRUCTOSE CORN SYRUP, PURE VANILLA BEAN EXTRACT,CITRIC ACID, SODIUM BENZOATE (PRESERVES FRESHNESS), BOTANICAL EXTRACTS, CARAMEL COLOR,HONEY, NATURAL FLAVORS. I like vanilla and honey, so I really like this drink. Henry really hit the mark again with this cream soda. Oh MAMA!! I love the fact that I can drink a good tasting Cream Soda and not have that icky pasty aftermath. Henry makes it possible for people like me to be able to drink a whole bottle of this. 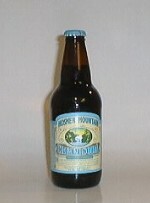 CARBONATED NON CHLORINATED WATER, HIGH FRUCTOSE CORN SWEETENER, BROWN SUGAR, CARAMEL COLORING, NATURAL AND ARTIFICIAL FLAVORING, CITRIC ACID, POTASSIUM BENZOATE (PRESERVATIVE), NO ARTIFICIAL COLORS OR CAFFEINE It is a dark colored cream soda, packed with frosty mug goodness. There is nothing wrong with this brew. I would like to have the flavor punched up a notch! Belch-O-rama! Oh yes…this is like candy. the color is most satisfying and then the taste just adds to the fun. I chose to sip it so it would last longer. Loren poured it so I think he gave hiself more.